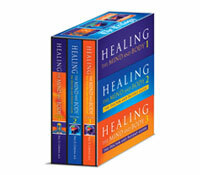 In the Healing the Mind and Body Trilogy Box set, you will enjoy each of the three volumes written by Dr. Paul Corona, MD, with easy cross-referencing between the books. In Volume 1, meet Dr. Corona and his many creative, breakthrough approaches based on his understanding of how neurochemical imbalances occur to create a number of common ailments and issues. In Volume 2, Dr. Corona helps you further understand how the cooperative healing process should begin in the exam room and what you can do to maximize its benefits. This book also details the more common nervous system issues and his unique solutions to stress (the #1 killer in America), mood disorders, addictions and the complete line of personality disorders. In Volume 3, follow Dr. Corona’s recommendations and instructives to fellow doctors in the treatment, record-keeping and progress-tracking of every unique patient. This volume also offers a complete and up-to-date guide to the psychotropic medications available today, as well as their pros and cons.